January 12, 2019 | Argentina: Buenos Aires | Source: Galileo Technologies S.A.
Argentina’s Galileo Technologies, a global natural gas solutions provider, has fueled six liquefied natural gas (LNG)-fueled Scania trucks at the Anchoris thermoelectric power plant in Mendoza province. 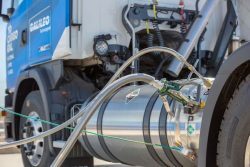 The Scania G340 trucks, owned by the Andreu carrier company from Mendoza, will transport the Virtual Gas Pipeline, the system used by Galileo Technologies to distribute gas as liquid fuel. “When this truck fleet working for Galileo starts riding the Argentine roads, we will show that LNG is the most adequate fuel for cargo transportation because it is national, clean and inexpensive”, said Osvaldo del Campo, President and CEO of Galileo Technologies at the time of the announcement. Fitted with two cryogenic fuel tanks that can load up to 265 kilograms of LNG, the trucks boast a 1100 kilometers fuel range. During their trips, that will include riding along mountainous routes and gravel roads, the new trucks will tow the trailers that Galileo uses to carry LNG from wells scattered around Mendoza and Neuquén to the recently opened Anchoris Thermoelectric Power Station, which runs on LNG. By using natural gas powered vehicles, Galileo Technologies expects to reach higher levels of environmental and economic efficiency. There will be fewer emissions from exhausts and lower fuel costs in each freight, representing 50% savings. 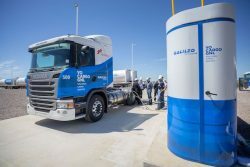 In the mid-term, Galileo Technologies will present a Blue Corridor of LNG filling stations so that the new fuel becomes available in the Argentine roads. The plan will include the availability of LNG dispensers for logistical centers. These dispensers will work without being connected to the natural gas network and will be supplied by the Virtual Pipeline, remotely monitored by a SCADA system. “In 1984 we successfully launched compressed natural gas (CNG). Now, with our own technology, we extend the use of LNG as a professional and high-power fuel in order to expand the productive boundaries of the country”, concluded del Campo. LNG is natural gas that is liquefied directly in wells out of the reach of pipelines in the provinces of Neuquén and Mendoza. This gas is new and completely national. The liquefaction technology developed by Galileo Technologies enables the use and distribution of this gas as liquid fuel.